Turmeric is a powerful anti-inflammatory and a very strong antioxidant. It fights free radical build up in the body, and boosts the activity of the body’s own antioxidant enzymes. It boosts endothelial function, which helps fight against heart disease, and regulates blood pressure, blood clotting and various other factors. It has been effective in the fight against tumours, and with the help of black pepper, controls and may reverse the free radicals that may lead to certain cancers. It can also help with arthritis and joint pain, and fight against depression and ADHD. 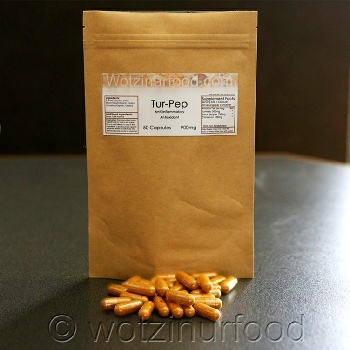 Wotzinurfood Tur-Pep is a 100% natural whole food capsule with no additives, fillers or any unnatural ingredients. 50 capsules 1000mg. Take one capsule with water daily. Do not use if allergic to any of the ingredients listed above, especially if pregnant and are lactating. Please specify if you need vegetarian capsules as standard capsules are beef gelatine and certified Kosher and Halal. Capsules can be carefully split and the contents put into liquid or sprinkle over food if the 00 capsules are too big. Store in a cool dry place and out of the reach of children. Should not be use in place of a varied and balanced diet.